Frequently, we see announcements showcasing a company’s new logo and slogan. And the headline reads, “Company X Undergoes Rebranding Effort.” In the marketing world, all too often, graphic designers, copywriters, web developers and more, refer to their service offering as branding. It is an overused and often misunderstood word. With all due respect to friends and colleagues in the design, copywriting, and web development fields, skills that I do not possess and greatly admire, those executional elements are not branding in and of themselves, they are the manifestations and outcomes of the branding process. A company brand is none of those things. It is the underlying promise the company makes to its customers and prospects and the unifying concept that bonds its internal culture and mission. The brand is that one idea, that single notion the company can own and consistently deliver that will differentiate it from its competition and will resonate with and motivate its target. The brand process starts with the analysis that will identify that single concept and articulate it in a simple brand platform statement. Once that is done, the work of designers, copywriters, web developers and all related facets of external marketing communication as well as the internal mission statement, job descriptions, incentive programs, etc. become easier to define and execute. The foundation is in place. All team members have a destination and direction. 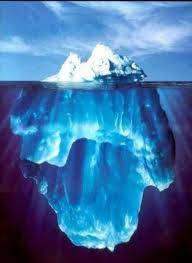 As you consider your company’s branding process, don’t focus only on the part of the iceberg you can see, it did not serve the Titanic and it won’t serve you.